The excerpt above is from How To Play In Traffic by Penn Jillette and Teller, published in 1997 and reportedly now out of print. But, whether or not the book’s out of print, this excerpt deftly demonstrates comedy timing. Or, perhaps in this case: counter-timing. Timing isn’t only important in comedy, of course; it’s crucial in many sports, such as archery or running (when should a runner add that final burst of speed, for instance?). And, in my opinion, timing is also often crucial to the success of a story. Whether that story’s a suspense, mystery, romance, or even literary, timing often makes as big a difference between “hit” or “miss,” as it does on the archery range. Just the right “oomph” has to come at just the right moment, after a long period of climbing tension, or everything can fall flat and lifeless. This is one problem I don’t believe the late Elmore Leonard suffered from. In fact—comedic timing or suspense timing—I think he had a great sense of both. How else could he have turned out a work like Get Shorty? 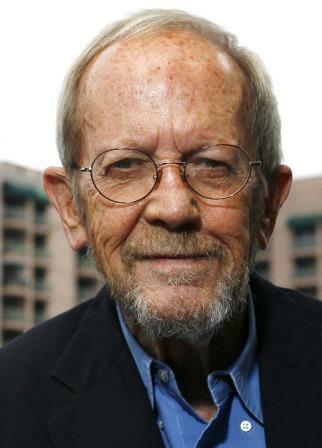 Frankly, I believe folks will be reading Elmore Leonard for decades, if not centuries to come. And, though the reasons they sight for reading him may change over time, I believe his “timing” will be a major ingredient for his writing’s longevity, perhaps even immortality. A comedian can physically stop speaking, wait a beat or half-beat, then deliver the punch line. But, how does one accomplish the same thing in the written word? A writer can’t very well write “Stop and wait a beat before reading the next sentence, please.” Yet, Elmore Leonard’s timing was terrific. He wasn’t necessarily talking about timing when wrote that. But, I strongly suspect his belief in the “white space” had a lot to do with his success in timing. How often does a comedian wind along on a story, raising the comedic tension — only to suddenly drop into silence for a beat, before delivering a verbal snap-kick that sends the audience reeling? That silent beat, or half-beat, is timing. And, in the written word as Elmore Leonard dished it up, I think the printed equivalent was often hidden in the white space he so revered. If white space, alone, did the trick, of course, I’m sure we’d see far more books with two or three lines of blank space between certain lines. And, that’s not terribly common, even in Elmore Leonard’s work. In fact, thumbing through four of his novels while researching this column, I found that he only did that to denote scene changes — a pretty common practice, I’m sure you’ll agree. So, how does white space help with timing? Never use an adverb to modify the verb "said,” he admonished gravely. Taken together, and in conjunction with a statement he made around the same time: “My most important rule is one that sums up the 10: If it sounds like writing, I rewrite it,” we’re left with a clear understanding of his desire to achieve spare or stripped-down writing. I took the opportunity to examine this list on a few other sites, and found it interesting, however, that Mr. Leonard made it clear: There is room for compromise. Reading what a character says, translating that into the “the way he talks” and using this to create a visual construct of the character may seem to be asking a lot from the reader. But, in an Elmore Leonard work it seems only natural. He writes the character so that a reader can hear the cadence of that character’s voice, the “beat” of his words. Sometimes, it’s a staccato beat. At others, it’s a languid throb. But the beat is there! And, injecting abundant white space, which is the natural outcome of spare writing, in just the right way, can then create a gestalt of sorts that results in remarkable literary timing—right there on the page. Of course, timing has to fit naturally into the voice that’s present, or the slight gear-change required to assure proper timing may signal a ‘heads-up!’ to the reader. This might work on occasion, but I suspect a more subtle manifestation of timing renders a bigger response on the part of the reader. And, Elmore Leonard was a master of this. Perhaps that's why so many of his narrative view points seem to stem from the so-called 'bad guys;' perhaps they provided voices with the requisite cadence for successful timing. good stuff. I also recommend his recent book fof stories, WHEN THE WOKEN COME OUT TO DANCE, which contains three stunners. That's funny, Rob. I actually bought When the Women Come Out to Dance, this afternoon. But of course the bad guys get the best lines- they've had them since that snake sidled up to Eve. When the Women Come Out to Dance is a great collection--it even includes a Karen Sisco story, and a good one at that. I think I've read just about everything he ever wrote, and managed to meet him twice. A truly nice man. Off the page, death always comes too soon for a great writer. Dutch himself once said he was influenced by George Higgins, a guy who wrote great bad guy dialogue (or monologues). Dix, I think I have all of Elmore's books, to include the westerns. But when I try to dissect his stories, like the experts say to do in order to learn how to do something in writing, I get so caught up in the story characters again that I read to the end and seldom notice how he did what he did. I've read only one of Leonard's books and liked it. Now, I'll have read more, and I'll start with "When the Woken Come Out to Dance." Since you have made me think about timing in storytelling, I'll be looking for it. I only hope I won't look so hard that I miss the story. I just downloaded When The Women Come Out To Dance to my kindle, and look forward to reading it. This group is good for lots of great information, not the least of which are book recommendations. I'm never disappointed. Dixon, my blog for Monday, August 26, 2013, is also about Elmore Leonard, but it's totally different, so I'm going to use it. I really enjoyed what you wrote about him, and his work, like his timing, will be immortal. Dutch was lucky in the movie adaptions of his stories and books about half the time, as early as THE TALL T, but it probably wasn't until picture-makers realized how tight his plotting and dialogue was that they stopped messing with his stuff. He had a poster in his office from the movie STICK, with a headshot of Burt Reynolds and the tagline, "He could do everything but stick to the rules." Dutch had scratched out "the rules" and written "the script." I love the observation about timing. I hadn't thought about it too carefully, but I have noticed that sometimes when someone gives me a piece of fiction for critique, it's the timing I notice being "off". White space helps, and so (I notice) does paying close attention to the numbers of syllables of the words, and where the punctuation falls. It winds up "counting out" almost like poetry. But until now, I never thought of it as timing.